Aaina is a reflective journey into the ancient and eternal soul of humanity. Since time immemorial, humans have been confiding their deepest fears and anxieties to the Mirror on the wall, along with sharing their moments of vanity and glamour. It is time now that the Mirror spoke up, to give people a glimpse of their desires, longings, anxieties, pains, fears, vanity, affections, love, and every facet that makes up the human psyche and soul. 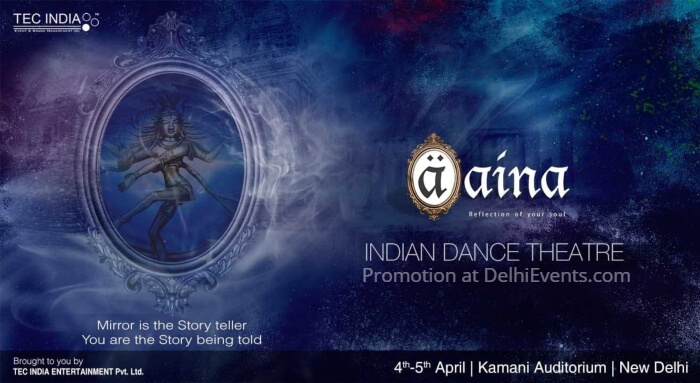 Bringing together a variety of art forms, and blending seamlessly music and dance styles both Indian and International, Aaina is a sensory spectacle. It is a concept which will make you ponder and revisit notions of existence. Conceptualized by a team of passionate artists and thinkers, Aaina is an honest telling of humanity’s tale – one which is sure to resonate with all who witness it.